Nearly thirty years ago, my adulthood studies in painting and drawing began at the Koho-School of Sumi-E, with Japanese brush painting. Art training then continued uninterrupted at Parsons The New School for Design and the Fashion Institute of Technology; including a life changing intensive drawing and painting program in Paris and the Dordogne, sponsored by Parsons. In 1997, I was clearly on a new career path when I enrolled at the National Academy Museum and School, and began work with the painter, Sam Adoquei. I also studied at Mr. Adoquei’s Union Square Atelier. My work appeared regularly in the Annual Juried Exhibitions at the National Academy; and in 2006, I was awarded the first Prize in Painting, and in 2007, the Reva Paul Prize in Still Life Painting. In 2008, I set up my own studios in New York City and the lovely Hudson Valley town of Pine Plains. Since then, my work has been exhibited in a number of venues. My still-life paintings and commissioned portraits have found wonderful homes in several private collections. For over thirty years, up until January of 2011, I also worked as a university professor, researcher, and writer. I hold a Master’s Degree in Theology from Yale University Divinity School and a Ph.D. in Psychology from The University of Chicago. I taught psychology, social science, and liberal studies at The University of Chicago and then at The Graduate School of The City University of New York, where I am now Professor Emerita. 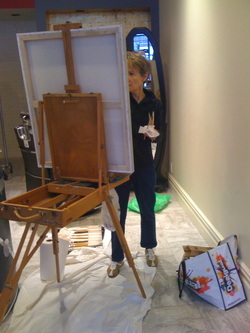 A painter joins a community of artists, past and present. 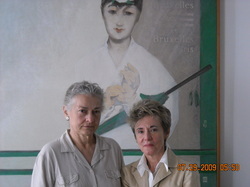 In this photo, GAP., an internationally recognized artist and friend working and living in Paris, and I (on the right) are standing in front of one of her large paintings: Empreintes claustra & Claus/ Le Balcon de Manet, Grand-Palais-Paris-Bruxelles, 1998/99. 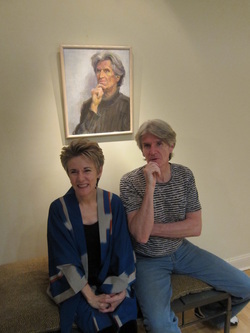 See my blog entry on 02/05/2011 for the story of how this photograph puts me in the company of at least 6 other artists: GAP. ; Manet who did the famous painting, The Balcony, that inspired the one we stand in front of; Goya who inspired Manet through his Majas at the Balcony; Fanny Claus the woman in the painting, i.e., the model for Manet's and GAP. 's paintings; and also the friend of Manet's wife, Suzanne Leenhoff, a pianist, and the wife of the impressionist painter Pierre Prins. Just one more connection: Fanny and Pierre are GAP's great grandparents. I am a full-time painter. In the spring of 2013, the final Ph.D. student whose research I supervised finished her dissertation. Although there may be an occasional psychology gig, painting is what fills and structures my time. Now, I apply as a painter what I learned from the study and teaching of psychology, religion, and other scholarly fields; research and writing; and really close collaborative work with students and colleagues. I thrive in painting still-life arrangements, interiors, but most of all, people. Using oil paint and pencils, I tell stories about the beauty, simplicity, and complexity of what I see in the world. I want each of my paintings gently to stop you in your tracks. I want you to pause and through my work engage with another person’s image, a silver bowl, a tree, or some other piece of the world. I intend to provoke both your curiosity and your concern. Although I want you to find what you are looking at beautiful, I also want you to ask and care about what just happened and what might come next for the person, place, or object in front of you.